Leslie Hunt began her life in the Chicago area, playing piano and singing at the age of four. Through the years, she has performed on many stages in many roles, and has been celebrated all throughout her development as a performer. While many will remember her from her all-too-brief stint on American Idol, where she made it to the top ten females, the singer/songwriter has since matured at an accelerated rate due to various personal and professional setbacks. Leslie performs regularly as a solo artist, enchanting rooms large and small with nothing but a piano and her voice. She also has a full backing band for shows that are less intimate, yet still wholly riveting. 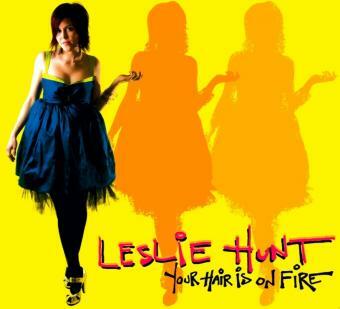 Leslie's new record Your Hair Is On Fire (Ellenel Records) is a product of passion and tragedy, helped along by the talents of drummer Vinnie Colaiuta (Frank Zappa, Herbie Hancock) and bassist Vail Johnson (Stevie Nicks, Herbie Hancock). In Leslie’s own words, “Many of the songs on Your Hair Is On Fire were written as an observation of someone on the path to self-destruction, hence the title, but the overall theme is optimistic, as I have most certainly learned volumes from such darker times.” What sets Leslie apart is that she straddles two extremes: a witty, bouncy pop artist in brightly colored dresses who is pitted against her darker self, a sensual, piano-crouched exhibitionist. Whether it is a cheerful, hook-heavy pop tune about love or a dark & insightful ballad of self-discovery, Leslie’s music is a window into a her soul for any listener willing to look.